Rick Acker has published so far 2 books in a Christian legal mystery series called Dead Man’s Rule, and two books in a young adult detective series called The Davis Detective Mysteries. Reading the Rick Acker books in order is really an easy feat. He is one of the best contemporary Christian thriller authors. Here are the Christian suspense author Rick Acker books in order for this series and standalone novels. The list will be updated with any new books Rick has written. Rick Acker was born in 1966. He was raised in Chicago. He received his law degrees from the University of Oslo and the University of Notre Dame, graduating with honors. Before moving to San Francisco, he spent 35 years in the Midwest. For a few years, Rick Acker worked as a senior litigator at Bingham McCutchen working on high-stakes litigations. The type of fraud he investigated while working here is included in his standalone legal thriller novel When The Devil Whistles. Currently, his daytime job is Supervising Deputy Attorney General in the California Department of Justice where his team prosecutes corporate law lawsuits. He only has time to write books during his commute to and from work. Some of the cases the author Rick Acker and his team investigated were high-profile cases, including fraud case concerning certain Wall Street players who created the toxic mortgage securities that lead to the Great Depression. The author currently lives in the San Francisco Bay Area with his family and two cats. Dead Man’s Rule features Ben Corbin, an attorney in Chicago running his own law practice. The series has currently two books. His second series, The Davis Detective Mysteries is a young-adult series featuring two sleuths, a brother and a sister, Arthur and Kristin Davis, who are hired to solve a few cases for the big guys. The author’s standalone novels are also legal thrillers, while his Davis Detective Mysteries is a fun children’s mystery series. As a lawyer, the author displays his knowledge elegantly in the books of both his series. If you’re worried about the ‘Christian’ aspect, it’s not too overwhelming, everyone can read the Rick Acker books in the series or his standalone novels without feeling uncomfortable. While the Rick Acker book series ended several years ago, each including two books, the author has continued writing standalone novels, most of which are Christian thrillers. His latest book is titled Guilty Blood, published in 2017. The book is a legal thriller featuring Jessica Ames who gets the news that her son, Brandon, has been locked up on suspicions of murder. She is not a rich person by any means, so she can’t afford a good lawyer for her son. Then she remembers someone from her past, Nate, a very wealthy and expensive lawyer from her past, whom she has to admit that she feels something for, so she decides to call him hoping that he might reciprocate enough to help her son. The story is an action-packed legal thriller which reminded me a little of Stuart Woods’ books. 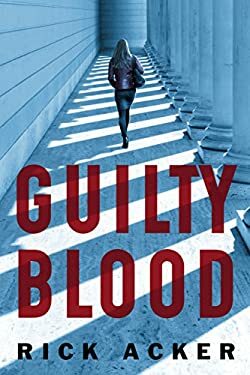 I do not like Christian themed books much, but I have to admit that the Rick Acker Guilty Blood story is a straight-up thriller with no Christian themes within. Rick Acker is a great legal thriller author, and while I do enjoy more reading series than standalone novels, Rick Acker’s standalone novels are up there with the best.